T. Rowe Price is much smaller in size and selection than Vanguard and Fidelity but they have plenty of high quality no-load funds that can allow an investor to build a great portfolio within one fund family. T. Rowe Price has only a few index funds but a sufficient selection of large-cap indexes. They also have some good sector funds and their target-date funds are outstanding. But which are the best T. Rowe Price Funds and how can an investor build a portfolio with them? You came to the right place for the answer! Before we choose the best T. Rowe Price funds to use for our portfolio, we'll review a simple but effective portfolio structure, called core and satellite, which is just as it sounds: The portfolio is built around a "core holding," such as a large-cap stock index mutual fund, which represents the largest portion of the portfolio, and other types of funds—the "satellite holdings"—each consisting of smaller portions of the portfolio to finish the whole. The satellites typically consist of funds from various categories, such as foreign stock, small-cap stock, bond funds, and sometimes sector funds. The primary objective of this portfolio design is to reduce risk through diversification (putting your eggs in different baskets) while achieving reasonable returns to meet the investor's long-term goals. This particular blend of T. Rowe Price funds is an example of a moderate portfolio, which is appropriate for an investor with a moderate (medium) risk tolerance and a time horizon of at least 5 years. Moderate investors are willing to accept periods of moderate market volatility (ups and downs in account value) in exchange for the possibility of receiving returns that outpace inflation by a significant margin. The asset allocation breakdown is 65% stocks and 35% bonds. The use of sector funds, such as PRHSX is optional. If other sectors are added, be sure to keep the allocation around 5% for each sector and try not to exceed a total of 15% allocation to sectors (i.e. 5% allocated to 3 different sector funds). Although this portfolio has five funds in it, there's no hard rule about the ideal number of funds to build a portfolio. A good range is somewhere between three and seven funds. 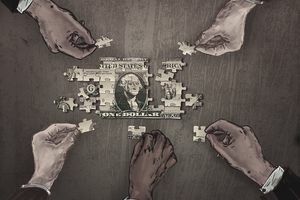 No matter which T. Rowe Price funds you choose, just be sure you are using a diverse mix of mutual fund categories and follow these guidelines on analyzing mutual funds.